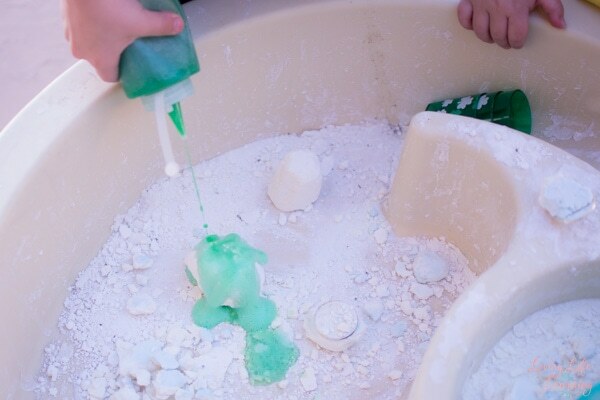 Last year, when we played with Baking Soda Letters in the Water Table, I found out that baking soda can be dried and reused even after it has already reacted with vinegar. 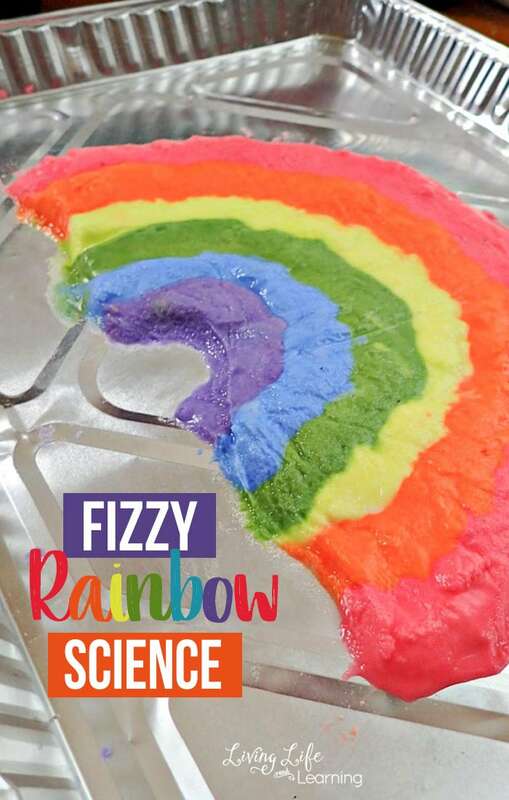 After our Fizzy St. Patrick’s Day Science activity a few weeks ago, we once again had a lot of wet baking soda left over, and E and I decided to turn them into Fizzy Treasure Rocks: We took large handfuls of wet baking soda, placed a gold coin in the middle, and formed the baking soda around it. 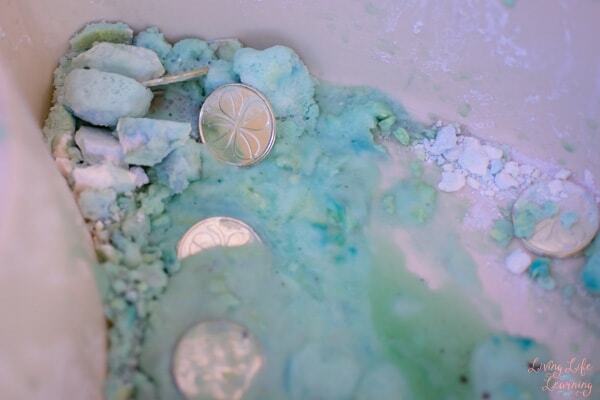 Gold coins or other small treasures to hide in the baking soda. 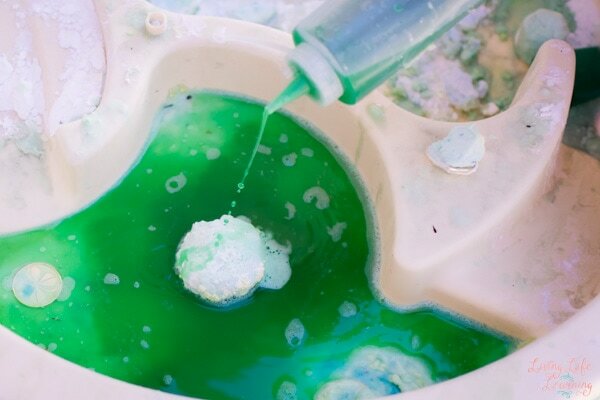 Fizzy tub colors, liquid watercolors or food coloring. 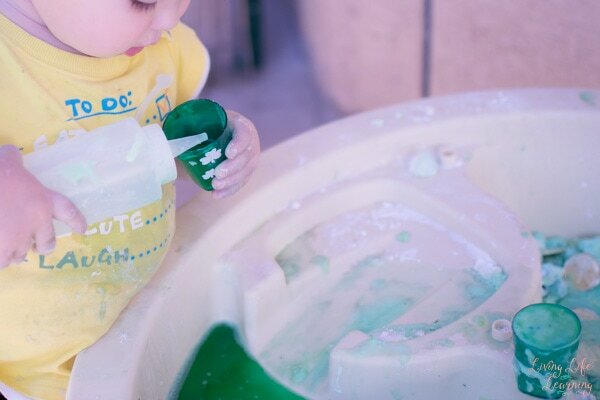 Water table (optional but great for minimizing messes and for sibling play). We let the fizzy treasure rocks dry for several days. Try to avoid handling them as much as possible, as they can be quite fragile once they’re dry. 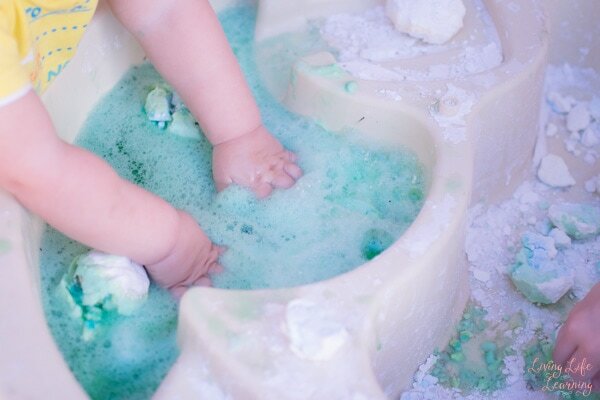 When we’d decided that they were dry enough, I gently placed the baking soda rocks in the water table. 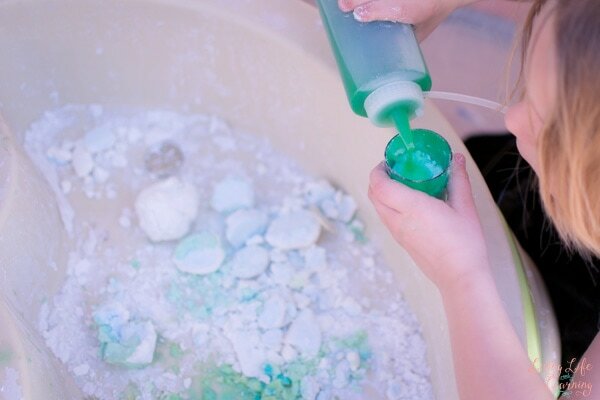 I also scattered some extra dried out baking soda that we hadn’t turned into treasure rocks all over the water table. E wanted to color the vinegar green again and put yellow and blue fizzy tub color tabs in one squeeze bottle and one pitcher full of vinegar. Then she got to work while N watched. She didn’t spend that much time on the treasure rocks, though. 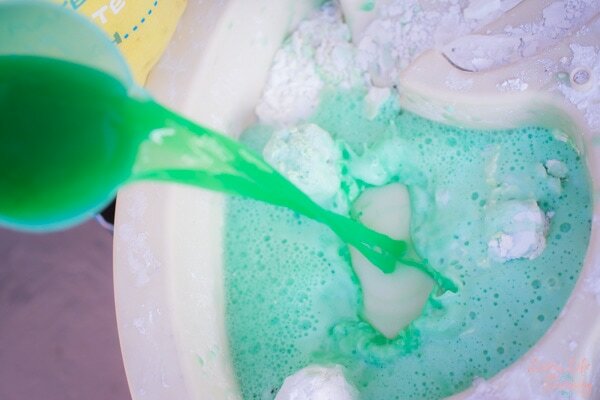 Instead, she decided to grab a small cup, fill it with crumpled up baking soda and add a tiny bit of vinegar. 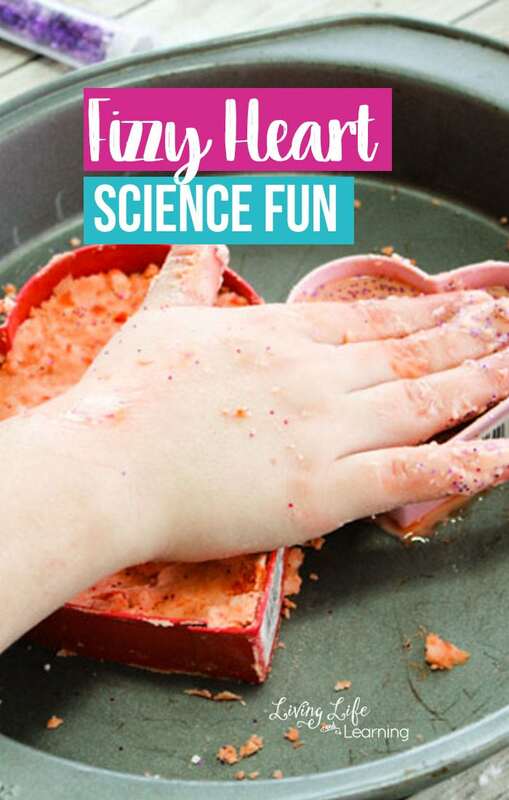 She’d wait until the fizzing stopped, add more baking soda, then add another tiny bit of vinegar. It was quite fun to watch, and she was extremely patient. Meanwhile, N went for mass fizzing action when he poured out the larger container all at once. 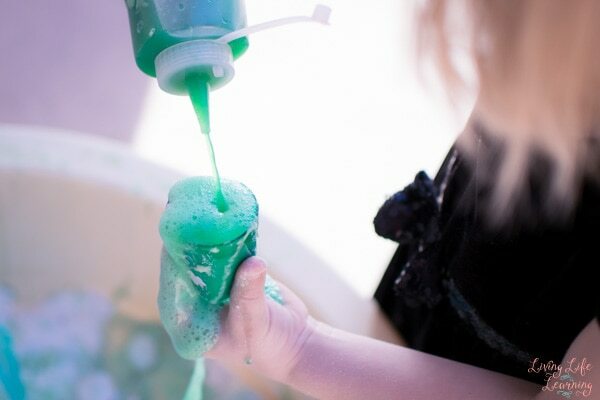 He chose the sensory approach to this activity and spent some time putting his hands in the foam over and over and splashing around. 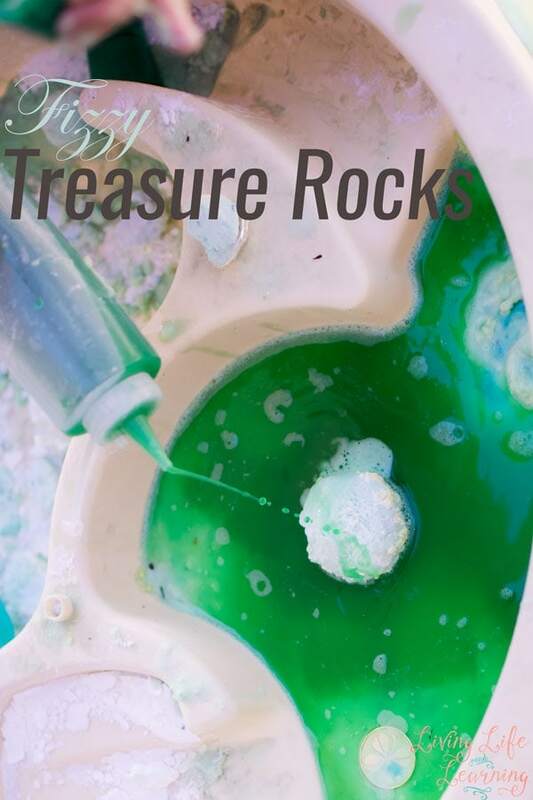 To finish off the activity, E asked for some more vinegar to work on the treasure rocks some more. Are you looking for other fun and simple activities? You could try this Fine Motor Activity with Straws and Pipe Cleaners or this Simple Transportation Sensory Bin!